More info about this release at discography/maxi-CDs. 09.05.2009 ZDF Carmen Nebel Show from Erfurt "The night is still young"
10.05.2009 ZDF Fernsehgarten "The night is still young"
27 March 2009 A long awaited new Sandra's album "BACK TO LIFE" is realesed in deadline. The album contains a lot of dance tracks, but it has the beautiful ballads as well. No doubts the song "The Night Is still Young" is a hit-song, that will plain to release as CD-single. Несмотря на то что альбом достаточно объёмный (15 треков! ), на самом деле Сандра записала гораздо больше песен. Кроме ранее выпущенного "Kiss My.." в качестве бонуса на сингле "In A Heartbeat" в альбом не попали треки "Echo Of My Heart" , "Redis Moi" и "Cri De Toi". Два последних трека записаны - на французском языке. Все бонусные треки были выставлены к продаже в он-лайн магазинах. Более полная информация об альбому размещена в разделе дискография/CDs. 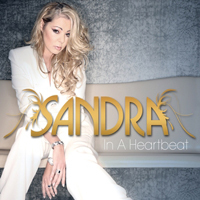 06 марта 2009 Sandra's brand new silnge "IN A HEARTBEAT" is realeased . 17 February 2009The german newspaper "BILD" published info that Sandra will married her boy-friend Olaf Manges (41) this summer in Malorka. It will be in church this time. Sandra: "I wanted to realize the dream with my ex-husbund but he's atheist. Now I want to get married at last. I've found the big love. I was unhappy". The full on-line version (on german) you can read here. 14 February 2009 The yearly official Thomas Anders Fan Party took plase in St. Valentine's Day at Koblenz (Germany) . For the first time Thomas publicly presented there a team-work with Sandra - the sample of song "The night is still young" . You can download the sample here. 13 February 2009The sooner anonced Sandra's performance took place at german satellite channel RTL at telecast "Ultimative Chartshow". Sandra sung medley included her hitmix number 1 "Maria Magdalena" and new song "In a heartbeat". Sandra appeared in stylish white trouser suit. There were also not cheap dancers beside her but team of musicians and even female backvocal. Like in old good time Myia Bi ( who had been accompaning her in tours in 1990-1992) is among the musicians . After Sandra's performance the presenter Oly Hassen took pasteboard cover of her first single and asked: "Is it really your first single or just second?" , after that the song"Andy Mein Freund" begun to sound in broadcast. Sandra was not cunfused at all. 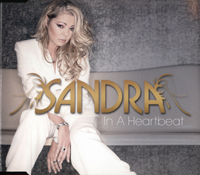 29 January 2009Мanagment of Sandra oficially report the information that new Sandra's single "IN A HEARTBEAT" will be released 06.03.2009. 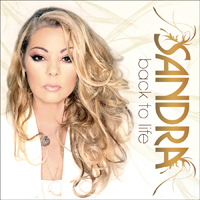 Moreover the new album of singer "BACK TO LIFE" ("Назад к жизни") will be released 27 March 2009 in Germany. The producer of new album is Jens Gad. There will be also offer the tracks produced by Axel Breitung ("Never Before"), (he already wrote hit number "Secrets Of Love" for DJ BoBo & Sandra) and by Zippy Davids Michael Kunzi & Tuneverse ("Put some 80ies in it"). 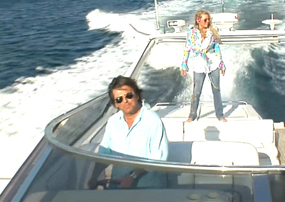 Duet Sandra & Thomas Anders with song “The night is still young” will be also present at the CD. 26 September 2008 Sandra took a place at the big "New York" casino in Moscow. This exclusive concert became the real present for her russian fans because the enter in casino was free. Sandra had appear as long-haired blonde in long slinky evening dress. Everybody was charmed. After concer the Sandra's fans had a chance to talk with her and her new boyfriend and also to get a long-awaited autographs. 30 August 2008 Later one week after Sopot festival, Sandra is on stage again. At open-air concert in german city Busum she has arrived with her boy-friend Olaf. The programm was very saturated one: soundcheck, appearance, autograph-session and even short interview for representative of german fans. At stage Sandra performed 10 song escorted by her dancers Tony and Dominick. First at stage the song "Seal It Forever" was presented by her. It aroused the storm of cheers from her fans. I short interview Sandra confessed herself that her little corpulence is result of hormone-therapy over leg-trauma and advanced her opinion on attacks of Sopot-journalists on the occasion of alcohol and playback. And she also told the her ex-husbund also found new girl-friend. .
23 August 2008 The regular "SOPOT" music festival is toolk place in Poland. Sandra was a guest among the honorary members. At stage Sandra sung 3 her hits "In the Heat Of The Night", "Maria Magdalen" and "Hiroshima". 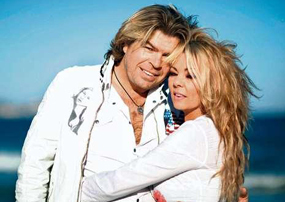 Besides Sandra, the disco-ladies Sabrina, Samantha Fox, Kim Wilde and gentelman Thomas Anders were also the honorary members of festivar. The polish satellite channel "TVN" broadcasted this evening. 04 January 2008The begin of 2008 year became the real gift for german Sandra's fan - Sandra appeared in german city Cologne. 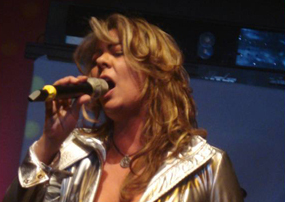 45-minutes show of singer was presented of 11 songs. 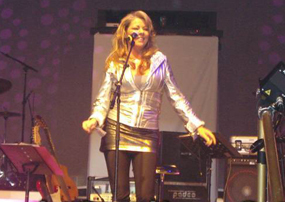 Sandra was in stage in black "buckskins", close miniskirt and silvery jacket. And no more office armchairs and crutch. Sandra is a good form again!